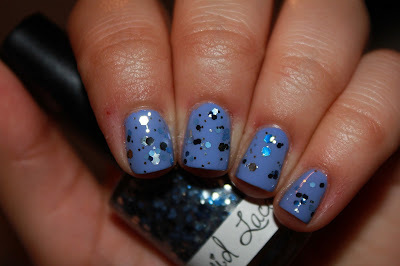 See Sarah Swatch: Liquid Lacquer Review Post! Hey all! I have some seriously great polishes to show you today. They're from the wonderful Liquid Lacquer, and I am so excited to show them to you all! Uhm, hi, how great is this one? It reminds me of snow, which is great when I'm dying of the humidity in Jersey. ACDNSM is a gorgeous polish, and it was opaque in 2 coats on me! I love the way the glitters look like they're floating in the whtie crelly base. And such a good choice on the glitter colors, it's not a crazy rainbow jumble, and it goes so well all together. Formula: great! Lots of glitter on the nail, covered VNL easily. CiY took me 3 thin coats, but so worth it! 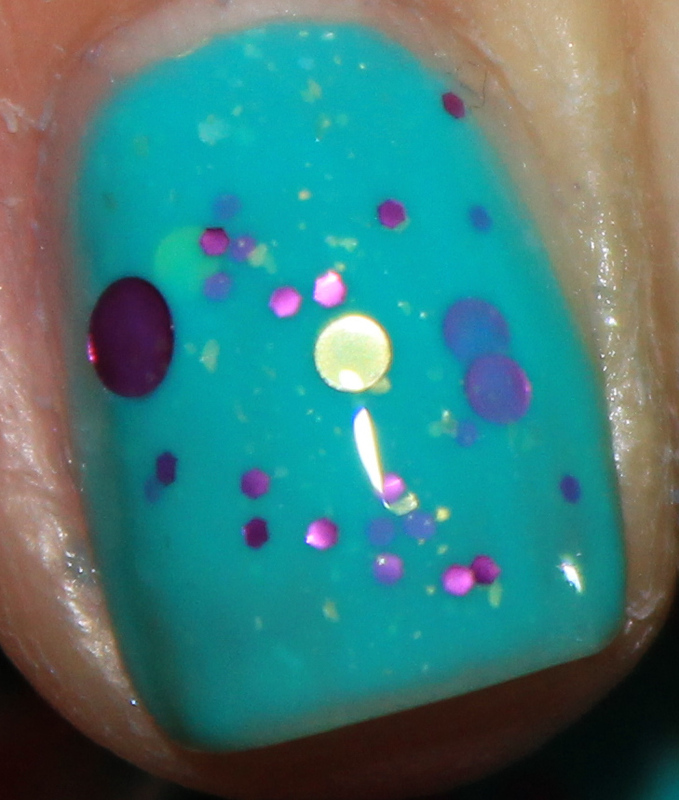 This is on its own, and I am obsessed with the magenta circles with this shade of turquoise! I also really love how this shade looks on me, so it was a definite winner. Formula: good! Glitter was easy to get onto nail, not too thick base. This glitter is in a clear base, so I put it over Boxer Shorts. This polish, to me, reminds me of ACDNSM, just not in a crelly base. Like it's the same color family, but you can put it over anything:] I saw a swatch of it over dark blue, over at A Little Polish... loooove! Formula: good amount of glitter with one coat! Yes yes yes. This is all sorts of perfect! 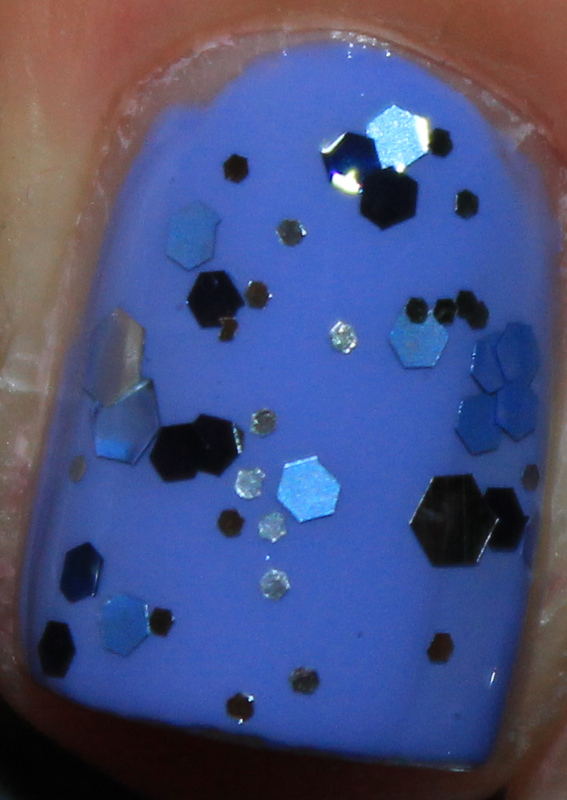 And probably my favorite glitter topper I have in my collection. I'm obsessed with the color combinations on this one! 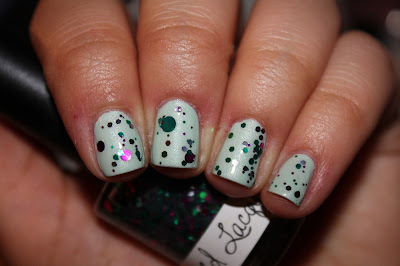 The different shaped mint and grey glitters are so subtly beautiful together! I wore this mani twice in two weeks, I loved how it looked on the nail. Also the stars? Perfect. Formula: good! 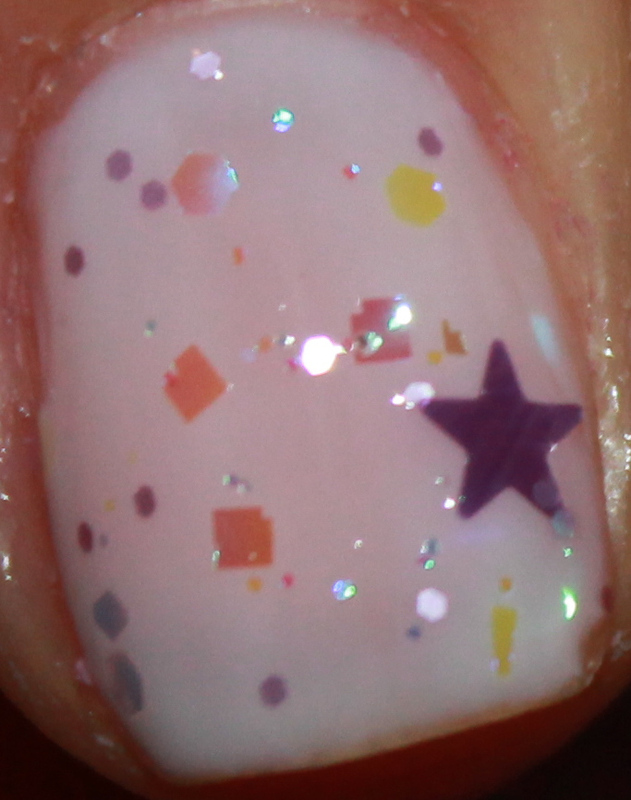 easy to get smaller glitters on nail, a tiny bit of fishing to get stars. Okay, all the yellowy or orangey parts you see there? Ignore them and imagine them as iridescent glitter. Makes the whole mani a zillion times better, trust me. 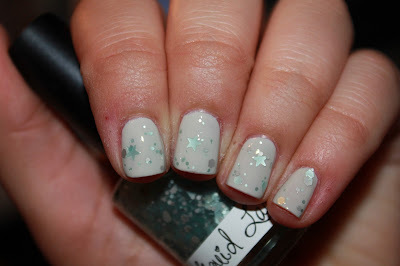 Formula: also great, not hard to get stars, iridescent glitters are abundant in one coat. Love the circles so much in this, and the color combination is really fun for spring and summer! Formula: eh, not as good as hoped, just wish there was more glitter in the base, had to do some digging and placing here. Stunninggggggggggg. You need this. Right now. 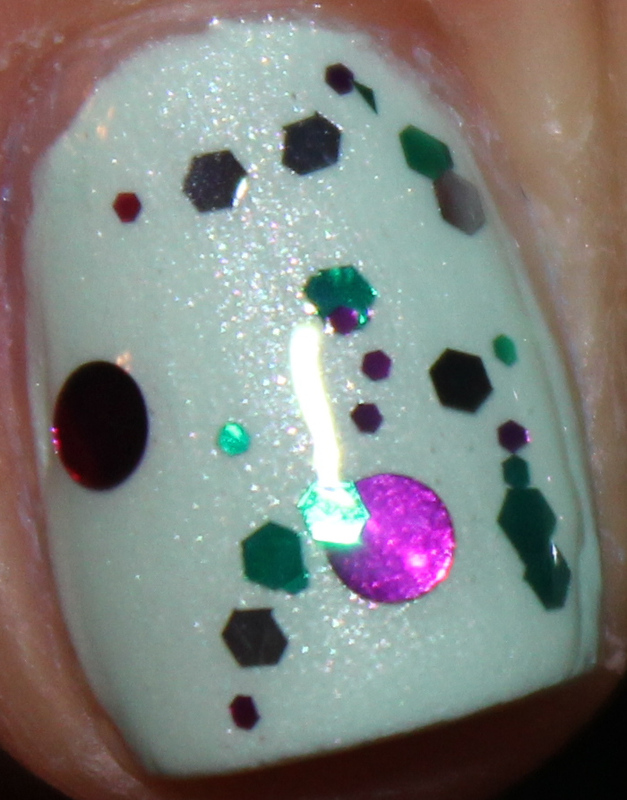 I LOVE unexpected holo colors and this is in my top 5 holos. The effect is definitely more linear IRL, trust me. And the shade is gorrrrrrrrrrrrrgeous. Get it. Now. Formula: great! Two coats, and good to go. In conclusion- just trust me and get Rain Song and Hydra, because I love them too much. It's not even funny. Totally great polishes, great customer service, and fast shipping. 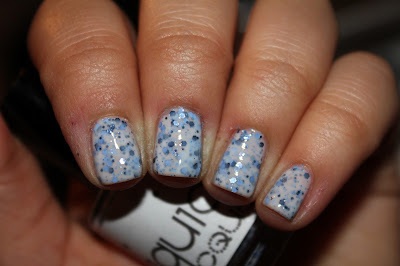 Definitely go check out Liquid Lacquer! I can't wait to place another order. I'm definitely in need of more holos from her! 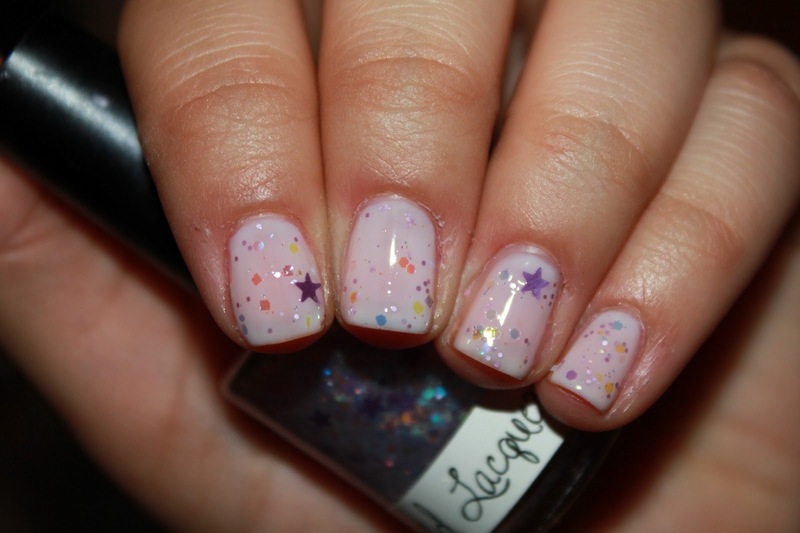 These are really pretty polishes!!!! Wow I love them all! They all look amazing! These are pretty - I love Rain Song! O. M. G. Rain Song. Drooool.